What all of these factors eventually boil down to is an imbalance in “cell turnover.” Cells in our body are constantly being destroyed and rebuilt -- a natural process that ensures our organs stay strong and function as expected. But if the “catabolic” (breakdown) arm of that process outweighs the “anabolic” (building) one, muscle loss sets in. As you might expect, sarcopenia can ultimately limit an individual’s ability to move independently and can increase the risk of falling, disability, and overall frailty.2 It’s even associated with other chronic illnesses like arthritis and insulin resistance.2 Therefore, it’s essential that we get out in front of it and focus on preventing its onset in our younger years. 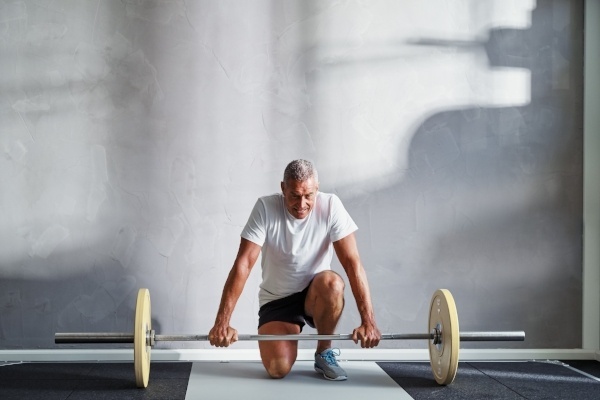 Building muscle is essential if you’re worried about sarcopenia sneaking up on you in the future, or if you’re already starting to sense some effects.3 Here are the best ways to increase muscle mass and prevent or reverse sarcopenia’s onset. In a surprise to no one, exercise is one of the best ways to build muscle. But you should know that different types yield different results. Most research shows that resistance training is your best bet, as it stimulates muscle growth and an anabolic state.4 Intensity, aka “load,” is perhaps the most important factor that connects strength exercise and muscle growth -- the heavier you lift, the more muscle you’ll build.4 When choosing a lifting plan, prioritize lower reps with higher weight rather than the converse, and perform multiple sets (3 is typical) of the same exercise or superset. Vitamin D has classically been connected to bone strength, but as nutrition research progresses, we’re seeing that it’s connected to much more in our bodies -- including muscle strength. While the exact mechanism isn’t quite clear yet, research showed that high vitamin D concentration in the blood (≥65 nmol/L if you’d like to take a peek at your InsideTracker chart) was associated with improved muscle function.10 To get levels like these, your best bet is probably vitamin D supplementation. Dosage is different for everyone, so use your InsideTracker recommendations to understand what’s best for you. Finally, research shows that adequate omega-3 intake can also help to stimulate muscle growth. Studies on young, middle-aged, and elderly adults found that an omega-3 fatty acid supplement stimulated muscle protein concentration and synthesis in muscles.11,12 You can add omega-3s to your diet from a variety of sources, including fatty fish like salmon, mackerel, and sardines, seeds like flax and chia, and pasture-raised meat and eggs. Fish oil supplements may also be a good option for you, but consult a healthcare professional before adding anything to your regimen. As new research emerges, it’s becoming increasingly clear that sarcopenia is also independently associated with overweight and obesity. In fact, a 2011 study found that increased fat mass was associated with a decrease in muscle quality and a faster decline of lean muscle mass in both men and women.13 Use what you know about healthy exercise and eating habits to stay on top of your daily calorie balance. As it stands, evaluating muscle function is the best method we have for tracking sarcopenia or any muscle-related changes. One of the best ways to keep track of your muscle function is to take a strength test every 4-6 months. Do your best to coordinate this with a personal trainer; a trained professional should administer it for you and take notes about your form, exertion, and the like. They’ll also help you calculate your “1-rep max,” a metric that will be most easily comparable test after test. Choose a set of exercises that test a wide array of muscles and functionalities. Include both pulling (row) and pushing (bench press) movements, fast (hang clean) and slow (squat) motions, and concentric (bicep curl), eccentric (reverse pull up), and isometric (plank) contractions to get a complete picture of your muscular makeup. Maintaining muscle strength as you age doesn’t have to be a chore. Make it a friendly competition with yourself! And keep the end goal in mind: a happy, healthy life at all ages. Ferrucci, Luigi, et al. "Of Greek heroes, wiggling worms, mighty mice, and old body builders." (2011): 13-16. Walston, Jeremy D. "Sarcopenia in older adults." Current opinion in rheumatology 24.6 (2012): 623. Leech, Joe, director. How to Avoid Sarcopenia (Muscle Loss from Aging). YouTube, Healthline: Authority Nutrition, 24 Aug. 2017, www.youtube.com/watch?v=t9wJ1ywLfog. Marzetti, Emanuele, et al. "Physical activity and exercise as countermeasures to physical frailty and sarcopenia." Aging clinical and experimental research 29.1 (2017): 35-42. Mason, Caitlin, et al. "Influence of diet, exercise and serum vitamin D on sarcopenia in post-menopausal women." Medicine and science in sports and exercise 45.4 (2013): 607. Abe, Takashi, Charles F. Kearns, and Yoshiaki Sato. "Muscle size and strength are increased following walk training with restricted venous blood flow from the leg muscle, Kaatsu-walk training." Journal of applied physiology 100.5 (2006): 1460-1466. Phillips, Stuart M. "Nutritional supplements in support of resistance exercise to counter age-related sarcopenia." Advances in Nutrition 6.4 (2015): 452-460. Dawson-Hughes, Bess. "Serum 25-hydroxyvitamin D and functional outcomes in the elderly–." The American journal of clinical nutrition 88.2 (2008): 537S-540S. Smith, Gordon I., et al. "Omega-3 polyunsaturated fatty acids augment the muscle protein anabolic response to hyperinsulinaemia–hyperaminoacidaemia in healthy young and middle-aged men and women." Clinical science 121.6 (2011): 267-278. Smith, Gordon I., et al. "Dietary omega-3 fatty acid supplementation increases the rate of muscle protein synthesis in older adults: a randomized controlled trial–." The American journal of clinical nutrition 93.2 (2010): 402-412. Koster, Annemarie, et al. "Does the amount of fat mass predict age-related loss of lean mass, muscle strength, and muscle quality in older adults?." Journals of Gerontology Series A: Biomedical Sciences and Medical Sciences 66.8 (2011): 888-895.